I bought this as a night moisturizer as it appears under this category, but I’m really disappointed. I have oily skin that needs a lot of moisture, but I found this to just add more oil to my skin and it made me breakout massively. My boyfriend who has very dry skin also tried it, but he just felt that the his skin became even drier. So can’t recommend it to people with oily or dry skin - maybe people with normal skin will find it good. Irina - Works wonderfully for me! I’m 32, combo skin with no problems like dark sports and fine lines. I really love taking care of my skin. About 3 months ago I started a 3-step evening skin care routine (peptide booster, omega 3 serum and ceramide moisturizer as the last one). I apply all the products all over my face, neck and under eyes as well. My skin tolerates them really well and likes them so much! It looks supply, even and really moisturized:) Highly recommended! Worth every penny! P.s. - Also, I currently use and love the following ones: resist anti-aging 10% aha exfoliant, resist anti-aging moisturizer spf30, resist anti-aging barrier repair moisturizer. 5 stars here as well! 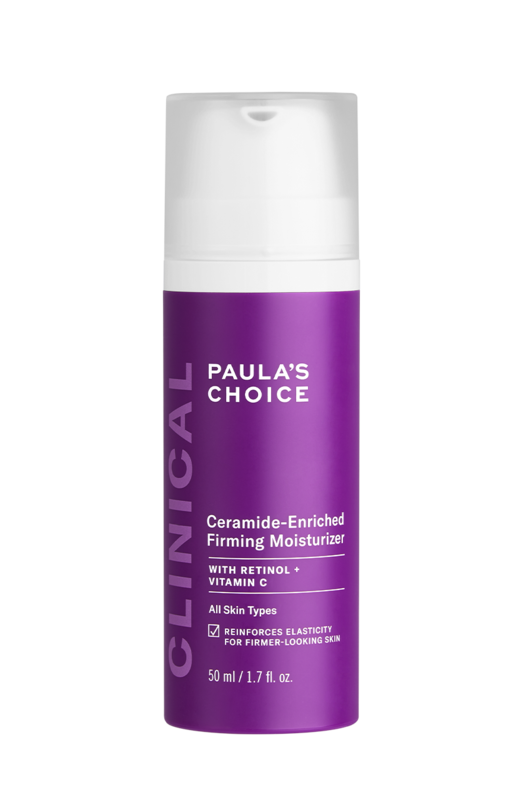 The only Paula’s choice product that wasn’t for me is clinical 1% retinol. Unfortunately, my skin simply couldn’t get used to it. I have combination skin with really dry areas around my chin. I've been using this moisturizer for a week and it's been beyond my expectations. The flaky dry patches of skin around my chin are gone and my skin feels soft and hydrated from day one. Having combination skin made me fear that this cream would make my skin look greasy or shiny but that didn't happen. It just looks healthy and feels super soft. Another great product from Paula's Choice that I strongly recommend and will buy again. Regarding the price: a small amount of cream goes a long way, making it last. Jessie - Works for me! Light but lovely! I have combination/dry skin and wake up with super soft skin. Clinical Ceramide-Enriched Moisturiser has really upped my skincare game. I'm 41, live in a cold, damp, unforgiving climate, and spend my working hours in an office building. My skin really started to show signs of aging -- it was sallow, droopy, tired-looking, with all my fine wrinkles becoming more pronounced. After two weeks of using this product, I can already see signs of improvement -- my skin is firmer, brighter, and plumper. Before, when I was smiling, I had a serious case of a shar-pei face . Now, all the lines and ripples are less pronounced and my lines and wrinkles are no longer etched into my face. I honestly hope that with continued use I'll be able to see even more improvement. My only gripe, rather unsurprisingly, is the price but I guess it's a price worth paying for a quality product. PC does offer discounts but it would be great if you introduced a rewards program. Overall, I recommend this product to everyone who feels like they've been getting good results with other PC products but have gotten to that point in their lives when they need a more potent and comprehensive product to combat more stubborn and ever-creeping signs of fatigue and aging.